Objective: Funnel plots (plots of effect estimates against sample size) may be useful to detect bias in meta-analyses that were later contradicted by large trials. We examined whether a simple test of asymmetry of funnel plots predicts discordance of results when meta-analyses are compared to large trials, and we assessed the prevalence of bias in published meta-analyses. Design: Medline search to identify pairs consisting of a meta-analysis and a single large trial (concordance of results was assumed if effects were in the same direction and the meta-analytic estimate was within 30% of the trial); analysis of funnel plots from 37 meta-analyses identified from a hand search of four leading general medicine journals 1993-6 and 38 meta-analyses from the second 1996 issue of the Cochrane Database of Systematic Reviews. Main outcome measure: Degree of funnel plot asymmetry as measured by the intercept from regression of standard normal deviates against precision. Results: In the eight pairs of meta-analysis and large trial that were identified (five from cardiovascular medicine, one from diabetic medicine, one from geriatric medicine, one from perinatal medicine) there were four concordant and four discordant pairs. In all cases discordance was due to meta-analyses showing larger effects. Funnel plot asymmetry was present in three out of four discordant pairs but in none of concordant pairs. In 14 (38%) journal meta-analyses and 5 (13%) Cochrane reviews, funnel plot asymmetry indicated that there was bias. Conclusions: A simple analysis of funnel plots provides a useful test for the likely presence of bias in meta-analyses, but as the capacity to detect bias will be limited when meta-analyses are based on a limited number of small trials the results from such analyses should be treated with considerable caution. Funnel plots, plots of the trials' effect estimates against sample size, may be useful to assess the validity of meta-analyses.4 10 The funnel plot is based on the fact that precision in estimating the underlying treatment effect will increase as the sample size of component studies increases. Results from small studies will scatter widely at the bottom of the graph, with the spread narrowing among larger studies. In the absence of bias the plot will resemble a symmetrical inverted funnel. Conversely, if there is bias, funnel plots will often be skewed and asymmetrical. The value of the funnel plot has not been systematically examined, and symmetry (or asymmetry) has generally been defined informally, through visual examination. Unsurprisingly, funnel plots have been interpreted differently by different observers.11 We measured funnel plot asymmetry numerically and examined the extent to which such asymmetry predicts discordance of results when meta-analyses are compared to single large trials of the same issue. We used the same method to assess the prevalence of funnel plot asymmetry, and thus of possible bias, among meta-analyses published in leading general medicine journals and meta-analyses disseminated electronically by the Cochrane Collaboration. We used a linear regression approach to measure funnel plot asymmetry on the natural logarithm scale of the odds ratio. This corresponds to a regression analysis of Galbraith's radial plot,12 although in the present context the regression is not constrained to run through the origin. The standard normal deviate (SND), defined as the odds ratio divided by its standard error, is regressed against the estimate's precision, the latter being defined as the inverse of the standard error (regression equation: SND= a+ bxprecision). As precision depends largely on sample size, small trials will be close to zero on the × axis. Small trials may produce an odds ratio that differs from unity, but because the standard error will be large, the resulting standard normal deviate will again be close to zero. Small trials will thus be close to zero on both axes—that is, close to the origin. Conversely, large studies will produce precise estimates and, if the treatment is effective, also produce large standard normal deviates. The points from a homogeneous set of trials, not distorted by selection bias, will thus scatter about a line that runs through the origin at standard normal deviate zero (a=0), with the slope b indicating the size and direction of effect.12 This situation corresponds to a symmetrical funnel plot. If there is asymmetry, with smaller studies showing effects that differ systematically from larger studies, the regression line will not run through the origin. The intercept a provides a measure of asymmetry—the larger its deviation from zero the more pronounced the asymmetry. If the smaller studies show big protective effects, they will force the regression line below the origin on the logarithmic scale. Negative values will therefore indicate that smaller studies show more pronounced beneficial effects than larger studies. In some situations (for example, if there are several small trials but only one larger study) power is gained by weighting the analysis by the inverse of the variance of the effect estimate. We performed both weighted and unweighted analyses and used the output from the analysis yielding the intercept with the larger deviation from zero. A Medline search (Knight Ridder Information Services, Berne, Switzerland) covering the period January 1985 to April 1996 was performed in April 1996 to identify published meta-analyses. For this purpose the word “meta-analysis” was entered in a free text search. The articles identified included all those indexed with the Medical Subject Heading (MeSH) keyword “meta-analysis,” which was introduced in 1989, and articles without the keyword which carried the word meta-analysis in their title or abstract. Results were tabulated by source of publication, and the items published in journals which yielded 30 or more hits were examined further. Meta-analyses of controlled trials combining at least five trials with binary endpoints were identified. Large scale randomised controlled trials of the same interventions which had been published after the meta-analyses were identified by a Medline search using appropriate keywords. Large trials had to provide an effect estimate with a precision of at least 5. For example, a trial among patients with heart failure in which mortality in the control group at three months is 5%15 and in which mortality is reduced to 3% among treated patients will need to randomise 2800 patients to measure this effect with a precision of 5 and about 12 000 patients for a precision of 10. Also, the effect estimate from the large trials had to be of equal or greater precision than the meta-analysis. We scrutinised potential matching pairs of meta-analyses and large trials with regard to study participants, interventions, end points and lengths of follow up. In some cases a further Medline search was performed to identify a meta-analysis published in any journal indexed in Medline which would be more suitable for comparison with the large trial. Some meta-analyses were published several years before the corresponding large trial. In these cases we examined whether the shape of the funnel plot changed when the meta-analysis was updated with trials published in the intervening period. SAS version 6.11 software package (Statistical Analysis System, Cary, NC) was used for statistical analysis. We performed a hand search of four leading general medicine journals, Annals of Internal Medicine, BMJ, JAMA, and Lancet, from 1993 to 1996 and examined the second 1996 issue of the Cochrane Database of Systematic Reviews16 to identify meta-analyses of controlled trials. Analyses that were based on at least five trials with categorical end points were examined further. For each intervention and comparison, the outcome measure which was reported in the largest number of trials was selected. To obtain consistency across reviews, end points were recorded if necessary so that the direction of effect for the expected beneficial outcome was in the same direction. For example, in a review of trials of nicotine patches in smoking cessation, continued smoking rather than quitting was considered to be the outcome, so that an odds ratio above unity indicates an adverse effect. We identified 38 Cochrane reviews and 37 journal meta-analyses. All references of meta-analyses and trials included are available from the authors on request. 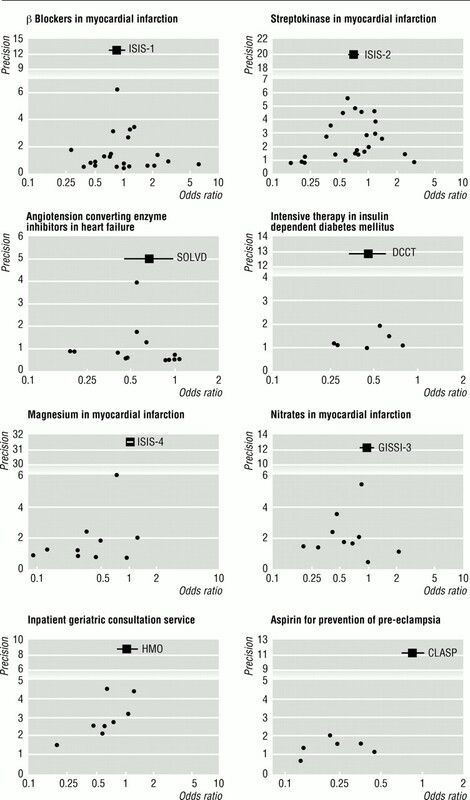 Eight pairs consisting of a meta-analysis and a large trial were identified (table 1).14 15 16 17 18 19 20 21 22 23 24 25 26 27 28 29 30 Five were from cardiovascular medicine, one from diabetic medicine, one from geriatric medicine, and one from perinatal medicine. Effect estimates from meta-analyses had an average precision of 7.9 compared with 14.4 for large trials. There were four concordant pairs15 17 18 19 20 21 22 26 and four discordant pairs14 23 24 25 27 28 29 30 (fig 1). In all cases discordance was a consequence of the meta-analyses showing more beneficial effects than the large trials. Three out of four discordant meta-analyses showed significant (P<0.1) funnel plot asymmetry; funnel plots from concordant pairs showed no significant asymmetry (2, table 2). Additional trials were identified for three meta-analyses published several years earlier than the large trial.26 27 29 These were extracted from more recent meta-analyses.4 31 32 When the meta-analysis of trials of intravenous magnesium in myocardial infarction was updated with five additional trials the intercept indicated even greater asymmetry (−1.36 (90% confidence interval −2.06 to −0.66), P=0.005). When 13 additional trials were added to the analysis of trials of angiotensin converting enzyme inhibitors in heart failure the plot remained symmetrical (intercept 0.07 (−0.53 to 0.67), P=0.85). When the analysis of aspirin for the prevention of pre-eclampsia was updated with nine additional trials, the funnel plot became asymmetrical (intercept −1.49 (−2.20 to −0.79), P=0.003) (fig 3). 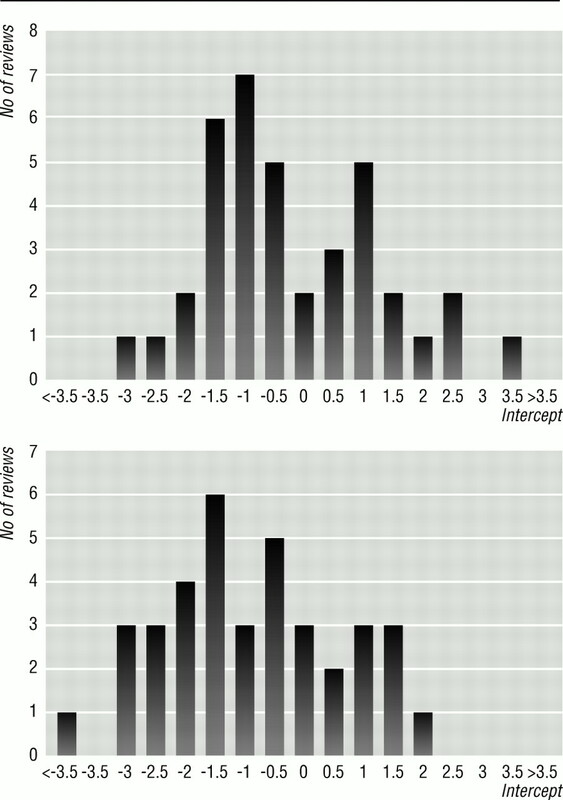 Figure 4 shows the distribution of regression intercepts from 38 Cochrane reviews and 37 journal meta-analyses. In the absence of bias, random fluctuations should produce a symmetrical distribution of intercepts around a central value of zero, with an equal number of positive and negative values. This is not what was observed. Distributions were shifted towards negative values, with a mean of −0.24 (−0.65 to 0.17) for Cochrane reviews and −1.00 (−1.50 to −0.49) for journal meta-analyses There were 24 negative and 14 positive intercepts among Cochrane reviews (P=0.10 by sign test) and 26 negative and 11 positive intercepts among journal meta-analyses (P=0.007 by sign test). In five (13%) Cochrane reviews and 14 (38%) journal meta-analyses there was evidence of significant (P<0.1) asymmetry. The selective publication of positive findings from randomised controlled trials is an important concern in meta-analytic reviews of the literature.9 If the literature is more likely to contain trials showing beneficial effects of treatments, and if equally valid trials showing no effect remain unpublished, how can systematic reviews of this literature serve as an objective guide to decision making in clinical practice and health policy? The potentially serious consequences of such publication bias have been realised for some time, and there have been repeated calls for worldwide registration of clinical trials at inception.1 4 33 34 35 Although registration of trials and creation of a database holding the results of both published and unpublished trials would solve the problem, it is unlikely that this will be widely instituted in the foreseeable future. Critical examination for the presence of publication and related biases must therefore become an essential part of meta-analytic studies and systematic reviews. The findings presented here indicate that a simple graphical and statistical method is useful for this purpose. When testing this method on pairs consisting of meta-analyses and single large trials of the same intervention, we found asymmetry in funnel plots in three out of four pairs with discordant results. The fourth was based on only six trials, and asymmetry emerged when it was updated with further studies. Publication bias has long been associated with funnel plot asymmetry.10 Among published studies, however, the probability of identifying relevant trials for meta-analysis is also influenced by their results. English language bias—the preferential publication of “negative” findings in journals published in languages other than English—makes the location and inclusion of such studies less likely.8 As a consequence of citation bias, “negative” studies are quoted less frequently and are therefore more likely to be missed in the search for relevant trials.7 36 Results of “positive” trials are sometimes reported more than once, increasing the probability that they will be located for meta-analysis (multiple publication bias).37 These biases are likely to affect smaller studies to a greater degree than large trials. Another source of asymmetry arises from differences in methodological quality. Smaller studies are, on average, conducted and analysed with less methodological rigour than larger studies. Trials of lower quality also tend to show the larger effects.38 39 40 The degree of symmetry found in a funnel plot may depend on the statistic used to measure effect. Odds ratios overestimate the relative reduction, or increase, in risk if the event rate is high.41 This can lead to funnel plot asymmetry if the smaller trials were consistently conducted in patients at higher risk. Similarly, if events accrue at a constant rate, relative risks will move towards unity with increasing length of follow up. In large trials, follow up is often longer than in small studies. Finally, an asymmetrical funnel plot may arise by chance. The trials displayed in a funnel plot may not estimate the same underlying effect of the intervention, and such heterogeneity between results may lead to asymmetry in funnel plots. For example, if a combined outcome is considered then substantial benefit may be seen only in patients at high risk for the component of the combined outcome that is affected by the intervention.42 A cholesterol lowering drug that reduces mortality from coronary heart disease will have a greater effect on all cause mortality in high risk patients with established cardiovascular disease than in asymptomatic patients with isolated hypercholesterolaemia. This is because a consistent relative reduction in mortality from coronary heart disease will translate into a greater relative reduction in all cause mortality in high risk patients, in whom a greater proportion of all deaths will be from coronary heart disease. This will produce asymmetry in funnel plots if the smaller trials were performed in high risk patients. Very different mechanisms can thus lead to asymmetry in funnel plots, as summarised in the box. It is important to note, however, that this will always be associated with a biased overall estimate of effect when studies are combined in a meta-analysis. The more pronounced the asymmetry, the more likely it is that the amount of bias will be substantial. The exception to this rule arises when asymmetry is produced by chance alone. How frequent is bias in meta-analysis? We thought that stringent criteria were necessary for identifying single large trials that could sensibly be used to assess the results from meta-analyses of smaller trials. As a result, the large trials used in our analysis on average provided an estimate of considerably greater precision that the corresponding meta-analyses. Despite an extensive literature search, we identified only eight such pairs. The matched pair approach may therefore not be suitable assessing the frequency of misleading meta-analysis. However, our results indicate that an asymmetrical funnel plot makes bias likely. The prevalence of funnel plot asymmetry may thus provide a useful proxy measure to examine the prevalence of biased analyses in the literature. Our findings indicate that bias may be present in a small proportion of meta-analyses published in the Cochrane Database of Systematic Reviews. Bias may be considerably more prevalent, however, among meta-analyses published in leading general medicine journals. Whether such bias is likely to affect the conclusions of a systematic review or meta-analysis must be carefully assessed for each case. Begg and Mazumbar proposed a rank correlation test to measure asymmetry in funnel plots.47 The method is based on the degree of association between the size of effect estimates and their variances. If publication bias is present, the smaller studies will show the larger effects. A positive correlation between effect size and variance emerges in this situation because the variance of the estimates from smaller studies will also be large. When we applied their test to the eight meta-analyses, it indicated significant (P<0.1) asymmetry for only one meta-analysis (inpatient geriatric consultation14). This indicates that the linear regression approach may be more powerful than the rank correlation test. In the absence of large, conclusive trials for most medical interventions, systematic reviews based on randomised controlled trials are clearly the best strategy for appraising the evidence. Selection bias and other biases pose a serious threat to the validity of this approach, however, and care must be taken to avoid meta-analysis becoming discredited. The technique discussed here should contribute to this goal, providing a reproducible measure for the likely presence, or apparent absence, of such biases. It is easily calculated and provides summary statistics that can be reported when space limitations do not permit the display of funnel plots. Though more methodological research is required, the critical examination for the presence of publication and related biases should be considered a routine procedure. The capacity to unearth such bias will, however, be limited when meta-analyses are based exclusively on small trials. There is no statistical solution in this situation, and the results from such analyses should therefore be treated with caution. We are grateful to Andreas Stuck and Gilbert Ramirez for kindly providing additional data. Funding: Swiss National Science Foundation (grants 3200-045597 and 3233-038803). .Getting to grips with Archie Cochrane's agenda.BMJ 1992;305: 786–8. .Rationale for systematic reviews.BMJ 1994;309: 597–9. .Experiences with meta-analysis in NDA submissions.Proc Biopharmaceutical Section Am Statist Assoc 1988;2: 28–33. .Misleading meta-analysis. Lessons from “an effective, safe, simple” intervention that wasn't.BMJ 1995;310: 752–4. .An exercise in mega-silliness.Am Psychol 1978;33: 517. .Publication bias in clinical research.Lancet 1991;337: 867–72. .Reference bias in reports of drug trials.BMJ 1987;295: 654–6. .Language bias in randomised controlled trials published in English and German.Lancet 1997;350: 326–9. .Meta-analysis: bias in location and selection of studies. BMJ (in press). .Summing up. The science of reviewing research. Cambridge, MA: Harvard University Press, 1984. .Factors affecting the comparability of meta-analyses and largest trials results in perinatology.J Clin Epidemiol 1997;50: 997–1002. .A note on graphical presentation of estimated odds ratios from several clinical trials.Stat Med 1988;7: 889–94.
. Large trials vs meta-analysis of smaller trials.How do their results compare? JAMA 1996;276: 1332–8. .Comprehensive geriatric assessment: a meta-analysis of controlled trials.Lancet 1993;342: 1032–6. Effect of enalapril on survival in patients with reduced left ventricular ejection fractions and congestive heart failure.N Engl J Med 1991;325: 293–302. The Cochrane Database of Systematic Reviews. Oxford: Cochrane Collaboration, 1996.
. Intravenous and intracoronary fibrinolytic therapy in acute myocardial infarction: overview of results on mortality, reinfarction and side-effects from 33 randomized controlled trials.Eur Heart J 1985;6: 556–85. Gruppo Italiano per lo Studio della Streptochinasi nell'Infarto Miocardico (GISSI). Effectiveness of intravenous thrombolytic treatment in acute myocardial infarction.Lancet 1986;i: 397–402. .Beta blockade during and after myocardial infarction: an overview of the randomized trials.Progr Cardiovasc Dis 1985;17: 335–71. Randomised trial of intravenous atenolol among 16 027 cases of suspected acute myocardial infarction: ISIS-1.Lancet 1986;ii: 57–66. .Meta-analysis of effects of intensive blood-glucose control on late complications of type I diabetes.Lancet 1993;341: 1306–9. Diabetes Control and Complications Trial ResearchGroup. The effect of intensive treatment of diabetes on the development and progression of long-term complications in insulin-dependent diabetes mellitus.N Engl J Med 1993;329: 977–86.
. Randomized trial of comprehensive geriatric assessment in the care of hospitalized patients.N Engl J Med 1995;332: 1345–50. .Effect of intravenous nitrates on mortality in acute myocardial infarction: an overview of the randomised trials.Lancet 1988;i: 1088–92. Gruppo Italiano per lo Studio della Streptochinasinell'Infarto Miocardico (GISSI). GISSI-3: effects of lisinopril and transdermal glyceryl trinitrate singly and together on 6-week mortality and ventricular function after acute myocardial infarction.Lancet 1994;343: 1115–22. .Relative efficacy of vasodilator therapy in chronic congestive heart failure.JAMA 1988;259: 3422–6. 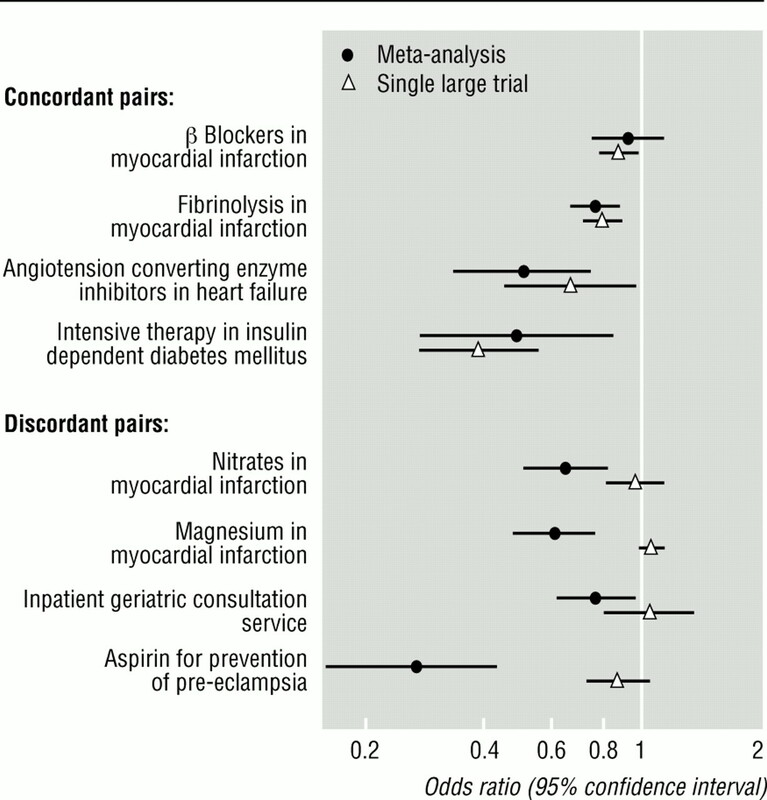 .Role of magnesium in reducing mortality in acute myocardial infarction. A review of the evidence.Drugs 1993;46: 347–59. ISIS-4: a randomised factorial trial assessing early oral captopril, oral mononitrate, and intravenous magnesium sulphate in 58,050 patients with suspected acute myocardial infarction.Lancet 1995;345: 669–87. .Ameta-analysis of low-dose aspirin for the prevention of pregnancy-inducedhypertensive disease.JAMA 1991;266: 261–5. 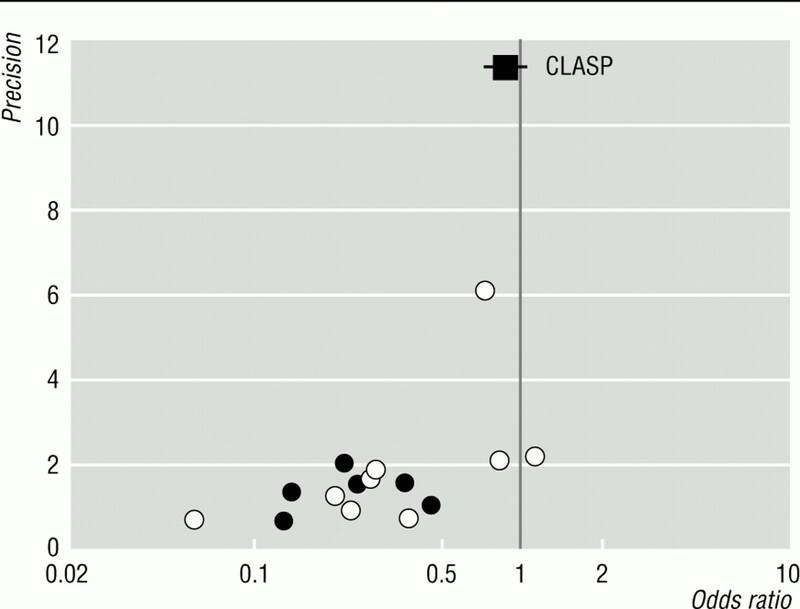 CLASP: a randomized trial of low-dose aspirin for the prevention and treatment of pre-eclampsia among9364 pregnant women.Lancet 1994;343: 619–29. .Overview of randomised trials of angiotensin-convertingenzyme inhibitors on mortality and morbidity in patients with heart failure.JAMA 1995;273: 1450–6. .Underreporting research is scientific misconduct.JAMA 1990;263: 1405–8. .Publication bias: its implications for clinical pharmacology.Clin Pharmacol Ther 1992;52: 115–9. .Are research ethics committees behaving unethically? Some suggestions for improving performances and accountability.BMJ 1996;313: 1390–3. .Cholesterol lowering trials in coronary heart disease: frequency of citation and outcome.BMJ 1992;305: 15–9. .Redundancy, disaggregation, and the integrity of medical research.Lancet 1996;347: 1024–6. .Bias in treatment assignment in controlled clinical trials.N Engl J Med 1983;309: 1358–61. .Empiricalevidence of bias. Dimensions of methodological quality associated with estimates of treatment effects in controlled trials.JAMA 1995;273: 408–12. .The scandal of poor medical research.BMJ 1994;308: 283–4. .Meta-analysis: principles and procedures. BMJ (in press). .Who benefits from medical interventions? Treating low risk patients can be a high risk strategy.BMJ 1994;308: 72–4. .Infarct size and magnesium: insights into LIMIT-2 and ISIS-4 from experimental studies.Lancet 1996;348: 1424–6. .Magnesium in acute myocardial infarction.Lancet 1997;349: 282. .Predictive ability of meta-analyses of randomised controlled trials.Lancet 1995;345: 772–6. .Do small trials square with large ones?Lancet 1995;345: 741–2. .Operating characteristics of a rank correlation test for publication bias.Biometrics 1994;50: 1088–99.